Your Ledger Nano S has two physical buttons, a screen and a USB cable. You control the wallet using the two buttons. When you use the buttons separately from each other you can scroll through the options. When you use both buttons at the same time you will confirm the current option; or go to the selected option. Connect your hardware wallet to your computer using the USB cable and follow the onscreen instructions. You can choose to create a new wallet, or initialize one that already exists. If this is the first time you use a hardware wallet you need to create a new one. Continue the on screen instructions. Choose and remember a 4-8 digit pincode. This code will be required every time you open your wallet. Confirm the pincode and make sure to remember it. The box includes a recovery sheet to write down your 24 words. Make sure to write these down carefully and double check you did not make any mistakes. These 24 words will function as your final backup, in case your wallet is lost or stolen. Make sure to store these words in a secure place. After you receive the message ‘Your device is now ready’ you are ready to go! Install some Ledger Apps or use the new Ledger Live interface to get started. You can now use the Ledger Nano S. Because the hardware wallet keeps your private keys separate from your computer it is much more secure do perform any transaction. They need to be validated and confirmed using the onboard screen and buttons. Questions? Feel free to contact our Premium Support. 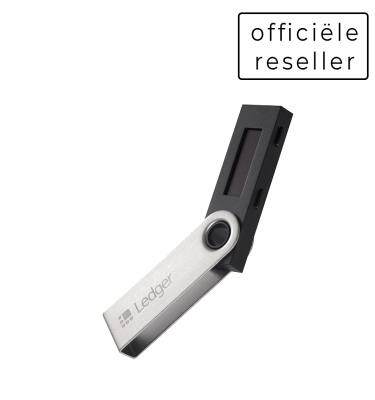 In case you do not have a Ledger Nano S you can buy it with us. We deliver fast and free to most European countries.